Atomic Games boss Peter Tamte has said that the studio could make more games focusing on the stories of soldiers taking part in other conflicts around the world. Almost a year ago to the date, Konami backed out of publishing Atomic Games' Six Days in Fallujah, a very controversial game based on the Second Battle of Fallujah during the war in Iraq, based off of the stories and testimonies of actual servicemen who fought in the engagement. 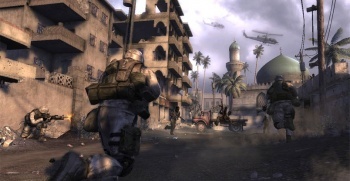 Despite fiscal struggles at Atomic, a source claimed in March that Fallujah was completed and ready for release as soon as the studio could find a publisher. Speaking with IncGamers, Atomic president Peter Tamte said that the controversy around the title had at least one positive impact - it brought the game to the attention of people in various armed forces around the world, who contacted the studio in turn. "[T]here are stories from across the world, and we got involved with Six Days in Fallujah because of our relationship with specific marines who served in that particular engagement," said Tamte. "As a result of Six Days in Fallujah, we actually have been contacted by people from across the world and other services and there are certainly other stories that are begging to be told." It's an interesting proposition, to be sure. During Tamte's keynote at last year's Triangle Game Conference, he said that the studio had initially been approached by Marines who wanted to tell their stories through the media with the deepest role in their lives - videogames. Why wouldn't there be many more men and women in different branches of the military - or even fighting under entirely different flags - who felt the same way? If Fallujah ever does come out, and I hope it will - and if it's a good game - would you like to see more like it?